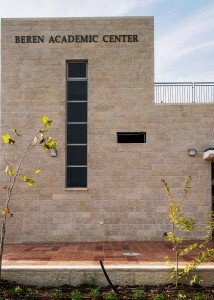 Located on the Israel Henry Beren Campus in Kiryat Shoshana, on the outskirts of Efrat, the Beren Academic Center complex houses the classrooms, lecture halls, Beit Midrash, college and library used by students participating in all of Ohr Torah Stone’s pioneering academic men’s programs. The Beren Academic Center serves as a hub for breakthrough Torah learning; a buzzing nerve-center from which a new type of Jewish spiritual and educational leadership emanates for Israel and the Diaspora. Men studying toward rabbinical ordination or toward an academic degree, men combining Torah study with service in the Israel Defense Forces, men studying to be rabbinical or educational emissaries and men studying for personal enrichment all interact and influence one another in the Beren Academic Center, creating a new type of contemporary leadership for 21st Century world Jewry.